MICHAEL Clarke's final words at the funeral of 25-year-old batsman Phillip Joel Hughes were a heart-rending ending to a funeral service that celebrated and mourned the young man in equal measure. "So rest in peace my little brother, I'll see you out in the middle". Clarke spoke through his tears about feeling Phillip's spirit everywhere. Feeling it on the Sydney Cricket Ground, feeling it in the support that washed in from all over the world after news spread of Hughesy's death. Clarke felt Phillip's spirit in the tiny town of Macksville, south of Coffs Harbour in northern New South Wales. By the time Clarke uttered that vow, he was losing the battle against his emotions. The moment he finished, they appeared to overwhelm him. He had lost not just a mate but a brother. The room had already been stunned quiet by the heartbreaking speeches given by Phillip's sister Megan and brother Jason. Each read letters. Jason spoke first. "My promises to you, firstly I will take good care of Mum, Dad, Megan and of course your beloved cows," he said. "I'm so proud of you, thank you again for all the memories. "I love you now and forever. Love your big brother, Jase." "I am so proud, along with Mum, Dad and Jason with what you have accomplished with your short period of time you were here with us. "There won't be a day that goes by that I won't think of you. I promise I will talk to you every day and keep you company up there. "I know now it's time to say goodbye but over the last few days I have realised goodbye isn't forever. The service opened with Forever Young by Australia's Youth Group and Phillip's coffin left the Macksville Highschool Hall to Elton John's Don't Let The Sun Go Down on Me. The funeral procession wound through the township, with residents, and thousands of out-of-town mourners will line the street. More than 1000, including 400 dignitaries packed the Macksville High School hall. Thousands more gathered in the streets for the final send-off. The service was broadcast live at the SCG, Adelaide Oval, the Gabba, the WACA and Melbourne's Federation Square. A tearful cricketing legend and teammate Michael Clarke courageously fought through his speech to express the deep love he has for lost mate Phillip Hughes. "So rest in peace, my little brother, I'll see you out in the middle". 3.15pm: Elton John's Don't Let The Sun Go Down On Me is played as the coffin is taken from the hall. Pallbearers include Michael Clarke, Aaron Finch, Tom Cooper, Phillip's father Greg and brother Jason. 3.10pm: Cricket Australia's James Sutherland addresses the service. Ed Smith once wrote that cricket is possessed of a rich poetic heart. For the cricket community today, that heart is heavy with sorrow. Cricket's heart has been pierced by pain but will never stop beating. Phillip Hughes, forever unconquered on 63. 3.06pm: Father Adcock delivers the Prayer of Commendation. The room is silent, most eyes red with tears. 3.01pm: A film is played in tribute to the beloved batsman. The room is otherwise silent. 2.59pm: Clarke ends his speech, rushing through the final words as his grief appears to overwhelm him. people across the globe have shown me his spirit is in action. It has sustained me and overwhelmed me in equal measure and the love of my band of baggy green gold brothers and sisters have held me upright when I thought I could not proceed. Warne and Lara showing their grief to the world, the spirit of cricket binds us all together. Players old and new rushed to his bedside where from wherever they heard the news to say their prayers and farewell s. This is what makes our game the greatest game in the world. We must listen to it, we must cherish it, we must learn from it, we must dig in, we must dig in and get through to tea. And we must play on. So rest in peace, my little brother, I'll see you out in the middle. 2.56pm: Clarke's determination to make it through his speech is incredible. He is repeatedly on the brink of breaking down completely. Is this what indigenous Australians believe in person's spirit being connected to the land on what they walk? If so I know they are right about the SCG. His spirit has touched it and it will forever be a sacred ground for me. 2.53pm: Cricketing legend Michael Clarke prepares to speak, battling tears. He'll definitely be calling me a sook right now, that's for sure. I don't know about you, but I keep looking for him. I know it's crazy but I expect any minute to take a call from him. Or to see his face pop around the corner. Is this what we call the spirit? 2.45pm: Macksville man and family friend Corey Ireland now speaking. He is speaking to "Hughesy's" passion for cattle. By now there is surely no dry eye left in the room, or in any loungeroom where the service is showing on the TV. 2.38pm: Megan now takes the microphone. As you all know, I'm Phillip's little sister. I'm standing before you today to show my love and appreciation for the big brother that I'll never forget. Phillip, I am so honoured to call you my brother, my best friend and my hero. Your smile, the twinkle in your eyes, your witty charm and the humour you provided will never fade. I am so proud, along with Mum, Dad and Jason with what you have accomplished with your short period of time you were here with us. There won't be a day that goes by that I won't think of you. I promise I will talk to you every day and keep you company up there. I know now it's time to say goodbye but over the last few days I have realised goodbye isn't forever. Until next time, I love you big brother. As I start writing I realise that this is the most important letter I will ever write. I still can't believe that I'm here saying my final goodbyes, even though you are my little bro, you have taught me so much. ...You always had the good looks, you always had the hair, and who said you needed braces to have a smile? You never took a bad photo. My promises to you, firstly I will take good care of Mum, Dad, Megan and of course your beloved cows. I promise to keep an eye on the investment market for some future business conversations down the track which we have discussed daily for the past two years. I promise to get back on the horse and play the game we both loved. I'm so proud of you, thank you again for all the memories. I love you now and forever. Love your big brother, Jase. Guests arrive at Phillip Hughes's funeral: Mourners arrive at the funeral for Australian cricketer Phillip Hughes in Macksville NSW. 2.33pm: Nino pays a final tribute to his cousin. 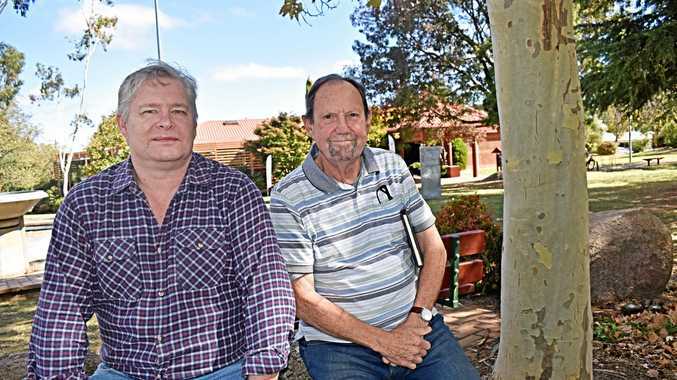 To everyone from Macksville throughout Australia, and around the world who have sent messages, gifts and heartfelt thoughts of support at this time of need, our family and friends pass on their appreciation. has touched so many. Phillip simply loved cricket. His family, friends and fans. But was the happiest on the farm with his dad and the cattle. I would like to leave you with one final quote that was sent to me by a close family friend post Phillip's passing. He who lives in the heart of so many never dies. I'll miss you greatly, Cuz, but I'll never forget you and the great times we shared. Thank you. 2.28pm: Nino tells of Phillip's goal to replace Matthew Hayden when he retired from the Australian cricket team. Matthew Hayden. I was fortunate enough to be at Pratten Park when Phillip made his grade debut for West second XI in a one-day match. When Phillip appeared from the change rooms padded up and heading out to the middle, the comments started with the first. "Gees he's small". The second "Has he got the power to hit the ball off the square?". Phillip moved to 10, then to the 20s, into the 30s and passing 50 with controlled aggression and with each boundary he gained more and more respect from the old boys. When he rose the bat for his century there was a large applause and listening to the now comments of the old boys, if I wasn't there previously you'd think there was a 6-foot man batting in the middle hitting every ball for four. 2.24pm: Nino continues, telling how Phillip first began playing cricket then went on to represent his region. Phillip was a normal country kid who loved the outdoors and sport. He enjoyed almost any sport including rugby league, athletics, swimming and of course cricket. Phillip's introduction to cricket was one of great persuasion by his brother Jason. Jason had started to play cricket and one weekend the under 10s team he was a part of was short on numbers. Out of pure desperation to play, Jason decided he would ask his younger brother Phillip to fill in as without Phillip the team would need to forfeit the match. that Phillip would be a wuss if he didn't play, Phillip finally agreed to his brother's request, albeit begrudgingly. On debut, Phillip made his cricketing appearance as a tail ender scoring 25 runs and from that moment he fell in love with the game. That was the start of hundreds, if not thousands of games of back yard cricket held in various backyards of East Street, Macksville. Phillip was first picked in his representative team at the age of 9 in the Nambucca Bellingen under 12s interdistrict team. Phillip opened the batting and scored 64. The score was an early milestone that Phillip cherished and became his one-day international number for Australia. He was one of a kind. A young kid from the country who dared to dream big and showed if you set your mind to it you can achieve greatness. "I know we all have so many questions this afternoon. Why Phillip? Why taken so young? How could such a thing happen to such a fine young man? And I have no answer to those questions. But I do know the world is a better place for having experienced the vitality, friendship, love, passion and energy of Phillip Joel Hughes." 2.05pm: The final arrivals into the funeral service were his family members. They arrived holding each other, arm in arm, as they entered the school hall. 2.01pm: Forever Young is played to mark the start of the service. The tone is set for what will be a very emotional service, not just for those in the school hall, but for all Australians and cricket fans. 1.59pm: All those inside the Macksville High School community hall are on their feet as the funeral service for cricketer Phillip Hughes begins. 1.43pm: Cricketing icon Shane Warne pays tribute to the lost 25-year-old. "He had a cheeky smile and he was good fun and, you know, a lot of people have said it is a good guy that has gone. "That is true because he was one of the good guys." 1.39pm: Michael Hussey describes Hughes as "a great little bloke". "It's going to be a sad day today. I hope we can celebrate his life because he was a champion bloke. "Cheeky smile and infectious around the dressing room and he is going to be sorely missed, that's for sure." 1.30pm: NEW South Wales bowler Sean Abbott has arrived in Macksville. He has signed the Hughes condolence book. Abbott bowled the bouncer that hit Hughes on the back of his skull, ultimately killing the young batsman. ABSOLUTE silence has greeted the arrival of Phillip Hughes' coffin as it was carried down Park Street in Macksville today. Green and gold streamers are lining the street to Macksville High School. About 100 mourners were already waiting, doing their best to shield themselves from the fierce sun. The much-loved cricketer's coffin arrived about 12.15pm and was carried into the school hall. At the Hughes family home, there was a simple hand written sign on a piece of paper. It was a simple reminder to the world's media to respect the family's privacy at their most difficult hour. THE life of Macksville's favourite son, Phillip Hughes, will today be celebrated in what will be one of the largest public funerals held in New South Wales in decades. Forever not out on 63, the diminutive opener, who blazed his way onto the international stage through the Macksville RSL and Sawtell Cricket Clubs, will be mourned at a public funeral at his alma mater, Macksville High School, from 2pm. In tribute to Phillip Hughes - the 408th cricketer to don the baggy green - bats have been put out, minutes of silence and applause have been marked worldwide and yet today the true extent of the nation's grief and loss will be evident in his hometown. 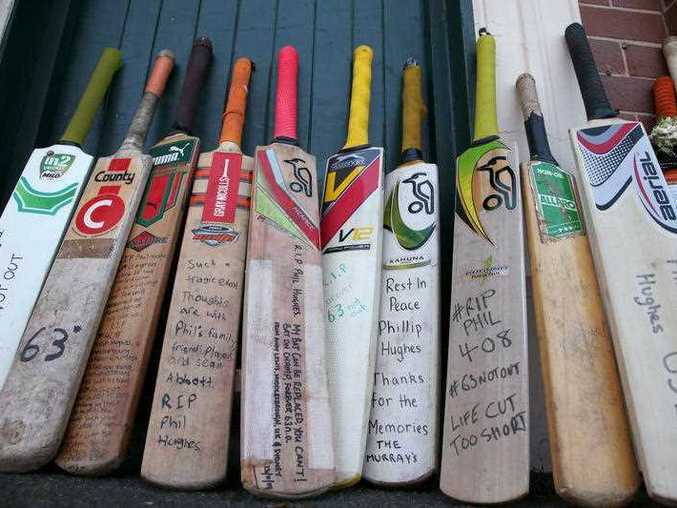 The Australian cricket team and top-tier players will pay their respects to the Hughes family. A procession through the town is planned, showing just how revered the 25-year-old was as a cricketer, son, brother and role model in his home town. With expectations of a large crowd at the funeral, airlines structured extra flights to Coffs Harbour late yesterday and today. The Nine Network will broadcast Phillip Hughes' funeral live this afternoon and Cricket Australia will stream proceedings online and at the Sydney Cricket Ground. AUSTRALIAN Test captain Michael Clarke will give a tribute at the funeral of Phillip Hughes in Macksville. Clarke is also one of eight pall bearers who will include Aaron Finch, Tom Cooper, as well as Hughes' father Greg and brother Jason. Almost 5,000 people are expected to attend the funeral. The entire Australian and Southern Stars squads will attend along with former national captains Mark Taylor, Steve Waugh and Ricky Ponting, Federal Opposition Leader Bill Shorten and NSW Premier Mike Baird will also pay their respects. Hughes' Sheffield Shield teammates from South Australia are set to show their respects while Shield rivals from across the country including his former NSW teammates are also making their way to the small, tight-knit Northern NSW community. The touring Indian team is expected to be represented by stand-in captain Virat Kohli. Pall bearers: Gregory Hughes, Jason Hughes, Michael Clarke, Corey Ireland, Mitchell Lonergan, Matthew Day, Aaron Finch, Tom Cooper. TO ACCOMMODATE the large numbers expected to converge on Macksville for the funeral of Test cricketer Phillip Hughes, Nambucca Shire Council has organised for several road closures around the venue. Immediately following the service there will be a guard of honour on Park Street, which is adjacent to the Macksville High School hall. Several roads will then be closed for a 40-minute public procession down Wallace Street, which will end at the Pacific Hwy. BRINER STREET (between Boulton St and Park St) - Tuesday 6pm to Wednesday 6pm. Note: Property access available for residents, Police, Cricket Australia and media officials. MARSH STREET (EAST) - Tuesday 9am to Wednesday 6pm. VIP coach parking only. PARK STREET - Tuesday 6pm to Wednesday 6pm. BOUNDARY STREET (between Matilda St and Wallace St) - Wednesday 2.45pm to 3.45pm. WALLACE STREET (between Boundary St and Cooper St) - Wednesday 2.45pm to 4.30pm Wednesday. Note: Will reopen progressively once rear police vehicle passes intersecting streets. WINIFRED STREET (between Cooper St and Macksville Ex-Services Club car park) - Wednesday 1pm to Thursday 7am. WINIFRED ST CARPARK - Wednesday 1.00pm to 5.00pm. 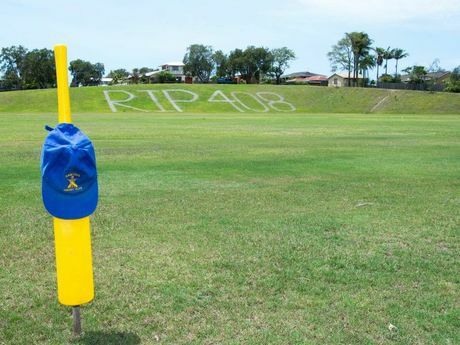 The Shire Council has advised there will be spill-over of funeral attendees onto the macksville High School sports field. Large screens and loud speakers will be installed to allow those present to see and hear the service in the stadium. A likely event is anybody wishing to attend the funeral will be on the sports field and therefore asked to take a chair, weather protection and water.